Attention citizens! 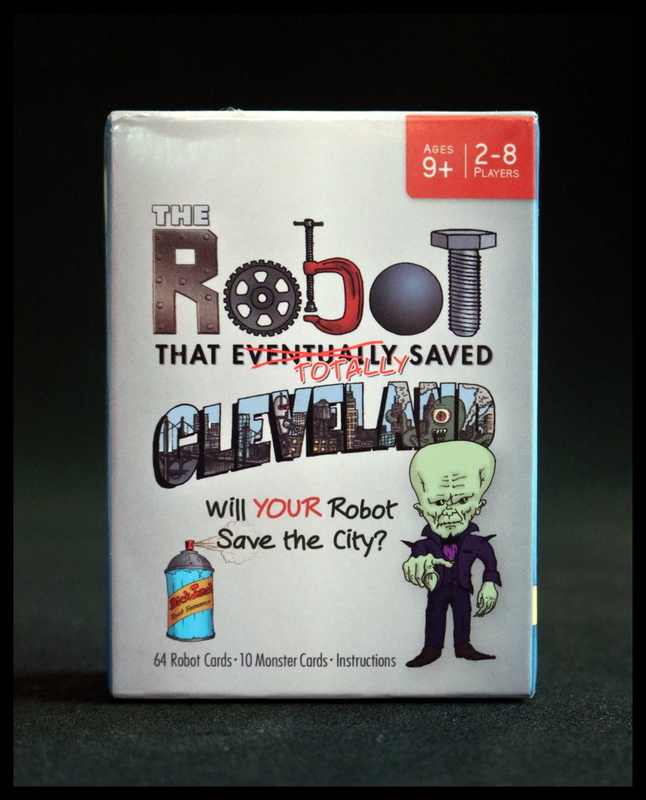 The Robot That Totally Saved Cleveland is all about building robots--the kind that are tough enough to defeat the evil Dr. Head Case & his mutant monsters! 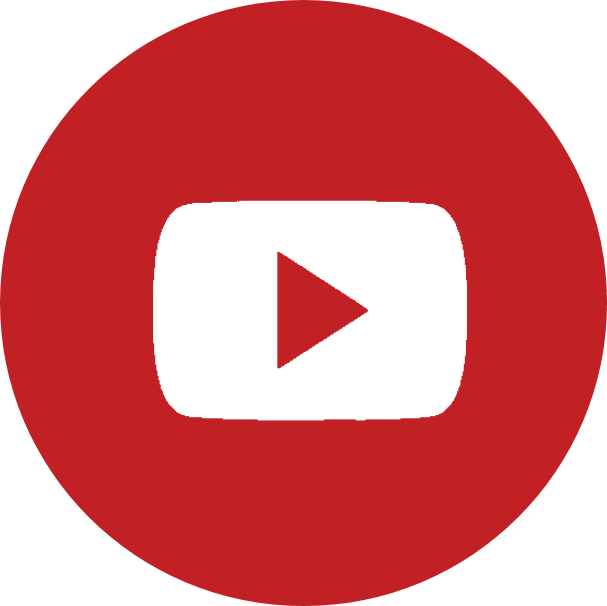 Game play is fairly simple. After quickly setting up the table per the instructions, just deal each player 5 cards. Turn over 4 cards from the draw deck to start the discard pile. 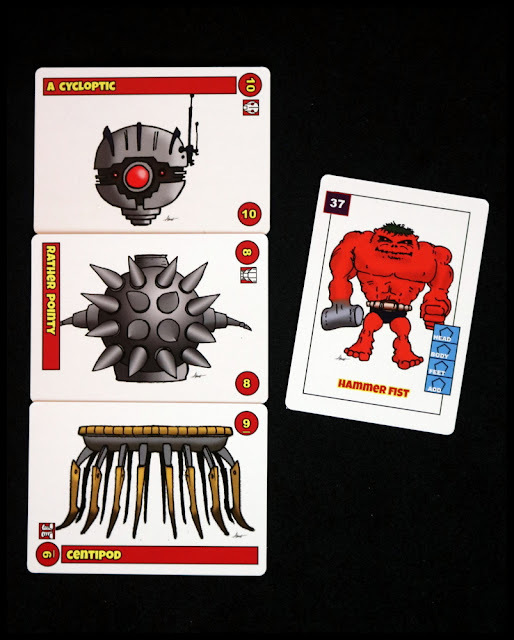 Turn over the first Mutant Monster, and start taking turns building the best Robot possible to defeat the monster. The evil Dr. Head Case has released his mutant monsters on Cleveland! It's up to YOU to salvage the best possible robot parts to build a tough enough robot to defeat the monsters one by one and eventually--no, TOTALLY--save Cleveland. 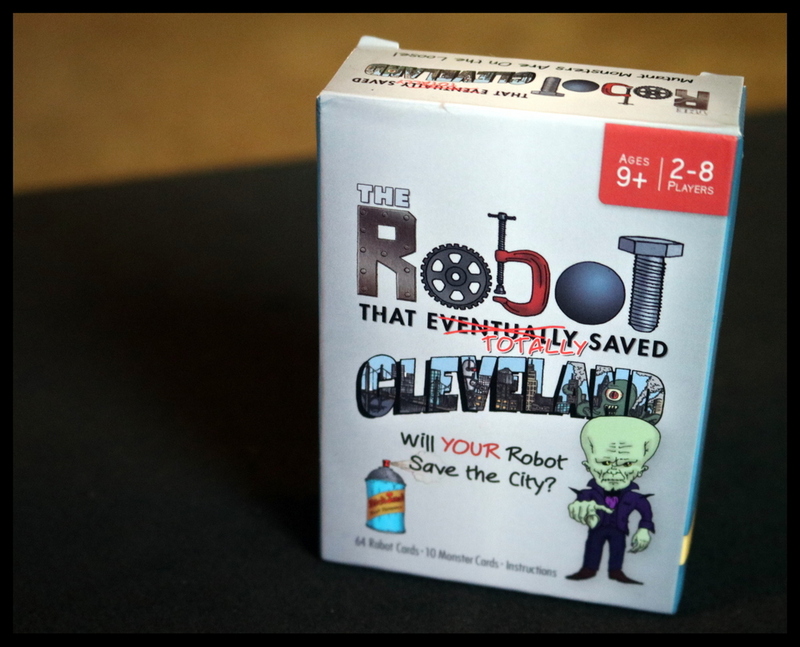 The Robot That Totally Saved Cleveland is a light-hearted, sci-fi themed set collection card game for 2-8 players ages nine and up. My family was immediately captivated by the theme of building wacky-yet-courageous robots to defeat the bizarre mutant monsters, and hooked by the cartoony illustrations and the often hysterical flavor text on the robot parts. 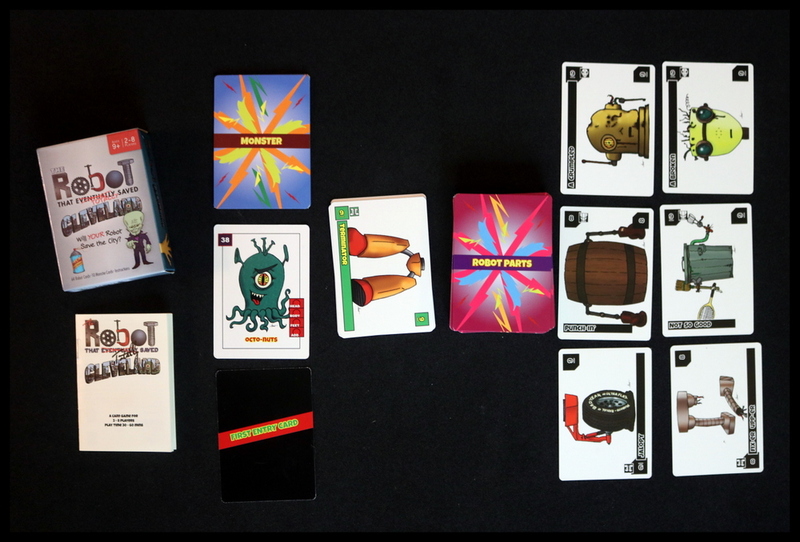 The set collection mechanic was easy to learn and the humorous storyline kept us playing again and again--sometimes we only had enough time to play one round and defeat one monster, and other times we sat down at the table to TOTALLY save Cleveland once and for all. 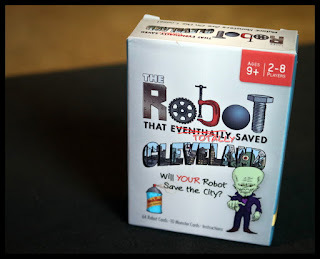 The Robot That Totally Saved Cleveland is a card game, and so the pocket-sized tuck box contains the petite rulebook, 64 Robot Part Cards, 9 Monster Cards, and 1 First Entry Card. 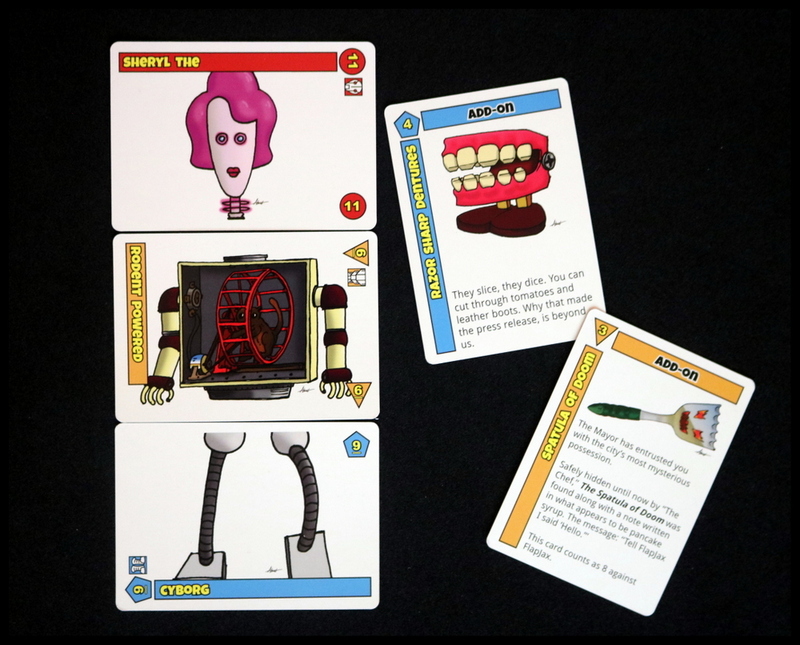 The cards themselves are glossy but durable and illustrated with bold imaginings of Razor Sharp Dentures or the Spatula of Doom. The flavor text on the cards was irresistibly readable and we shared plenty of laughs each time we turned up a new card or announced our final robot entries, like Sheryl the Rodent Powered Cyborg. Setup is quick: separate the Monster Cards and the First Entry Card--these go to one side of the table--and the six Bargain Center Cards on the other side, with the Robot Parts in the middle. 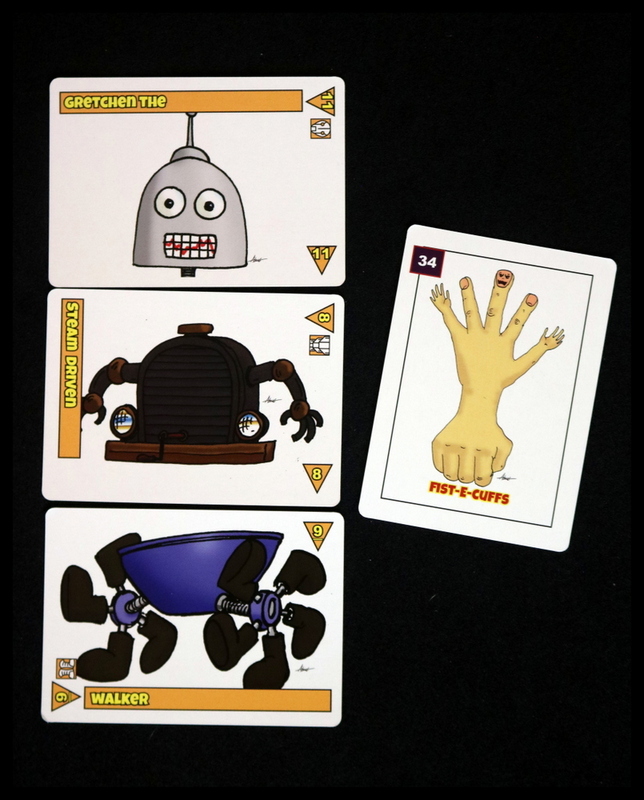 Each player gets a hand of five Robot Parts cards, and four are flipped over to start the discard pile. 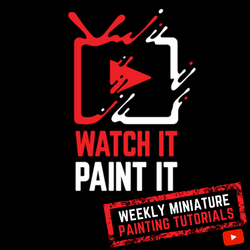 A quick review of the card types and a read through of the rules, and you'll be ready to play in under five minutes. The gameplay of The Robot That Totally Saved Cleveland is familiar enough for card-playing families--draw a card and discard a card in the hopes of having the first and/or best hand. 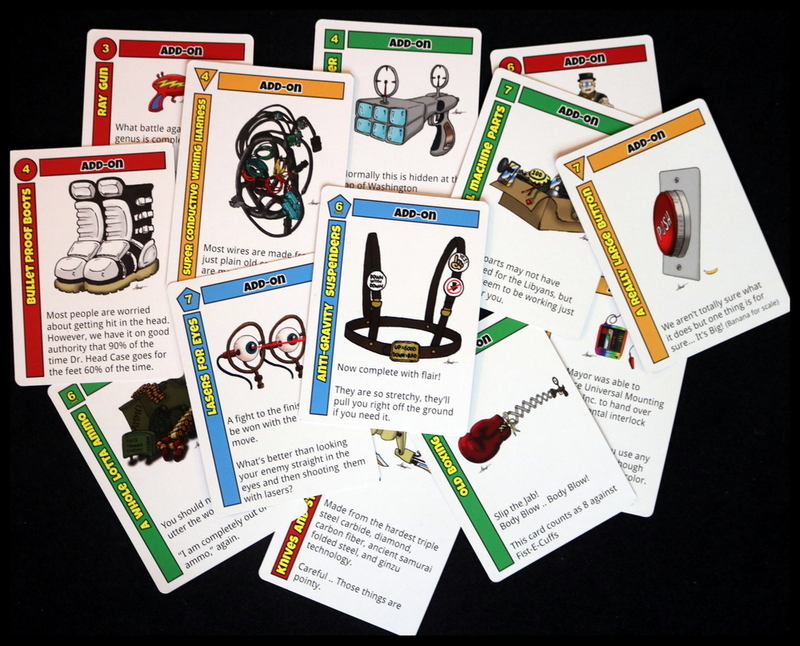 This makes it fairly easy to jump into your first game, as you learn about the different card types and powers. 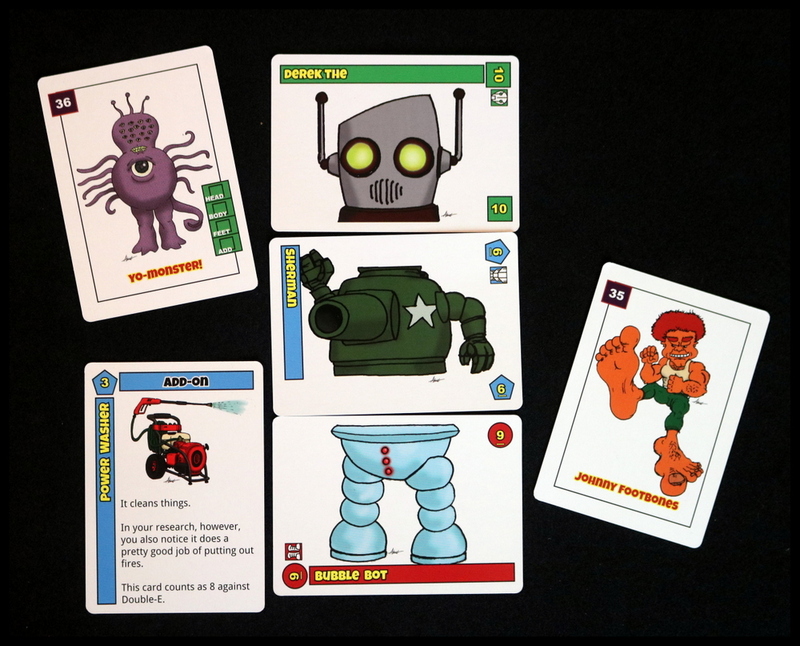 The first player to think they have a strong enough robot to defeat the current monster will pull the First Entry card on their turn--then everyone else has one more turn to bring their robots up to snuff (and usually snag the colorless but better-than-nothing parts out of the Bargain Center). Final robot points are compared by adding the total points on your head, body, and feet, plus your add-on, and bonus points for having multiple cards of one color), and the most powerful robot defeats the monster. There's luck here, and a little bit of strategy (when do you buy from the Bargain Center? If you discard this card, will your opponent pick it up to complete their red robot?). 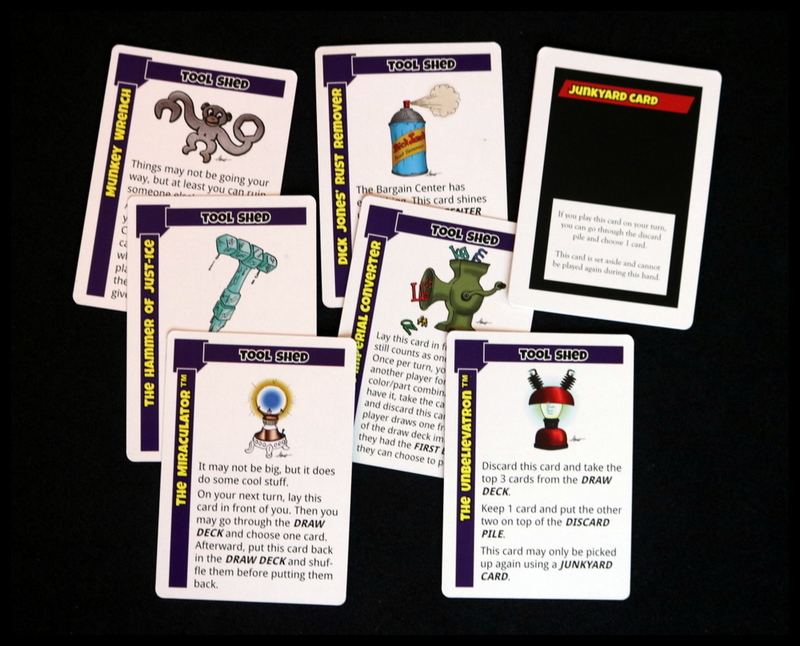 There are purple Tool Shed Cards which give you a little bonus action, and Junkyard Cards that let you dig deeper into the discard pile. In general, the game is light and comfortably familiar but with lots of laughs as we read the card names and flavor text aloud or sniped the best parts from each other to try to defeat Johnny Footbones or the Yo-Monster! 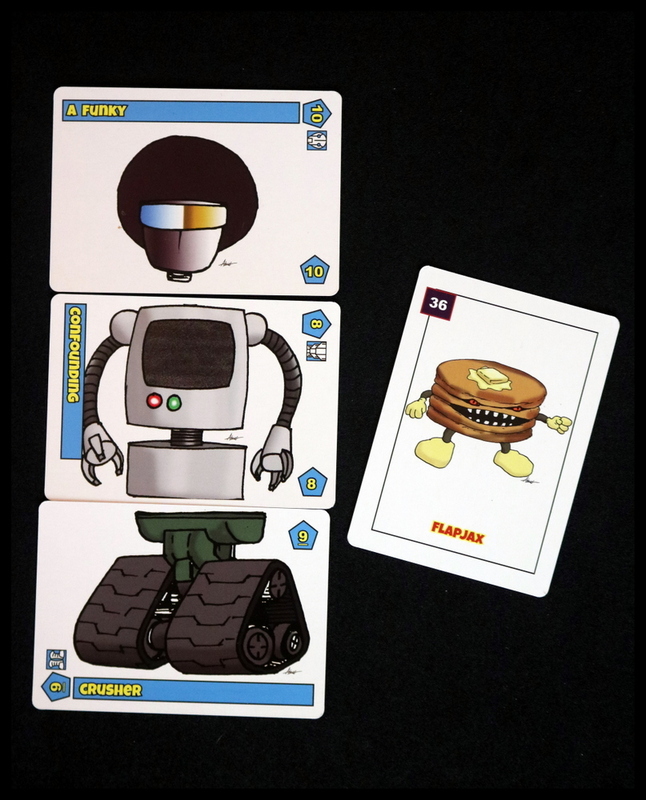 The Robot That Totally Saved Cleveland is funny--a truly laugh-out-loud game as you flip over silly parts and read amusing flavor text. 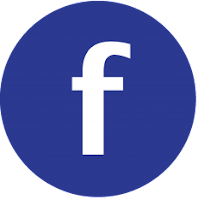 (A Really Large Button: We aren't totally sure what it does but one thing is for sure... It's Big! Banana for scale.) 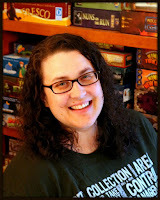 The sci fi, monsters-and-robots theme is very engaging, especially for geeky families and circles like my own. The draw-and-discard, set collection mechanics are easily taught with enough differences to keep you from thinking you've played this game before. 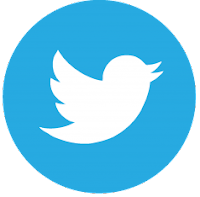 As with many games that my family enjoys, this one might not be your cup of tea if you're looking for serious, strategic, or heavy gameplay. 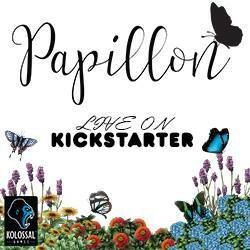 It's a card game, light and comical, with luck and a splash of probability-driven strategy. We enjoyed it, but you might not. 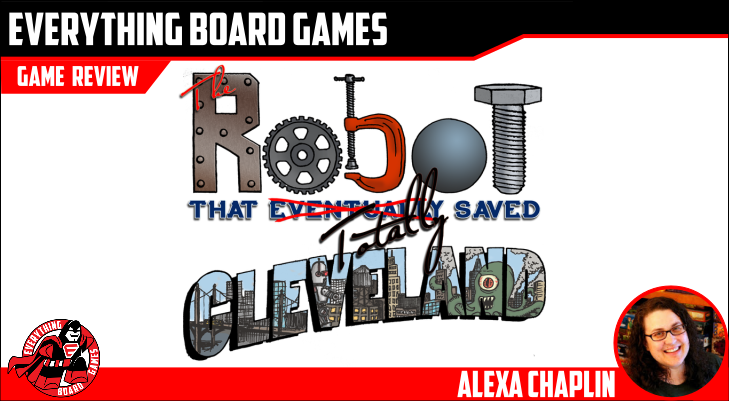 If your group enjoys goofy card games from Guillotine to Alienation to Fluxx, you may also enjoy The Robot That Totally Saved Cleveland. The Robot That Totally Saved Cleveland is absolutely a keeper for us. 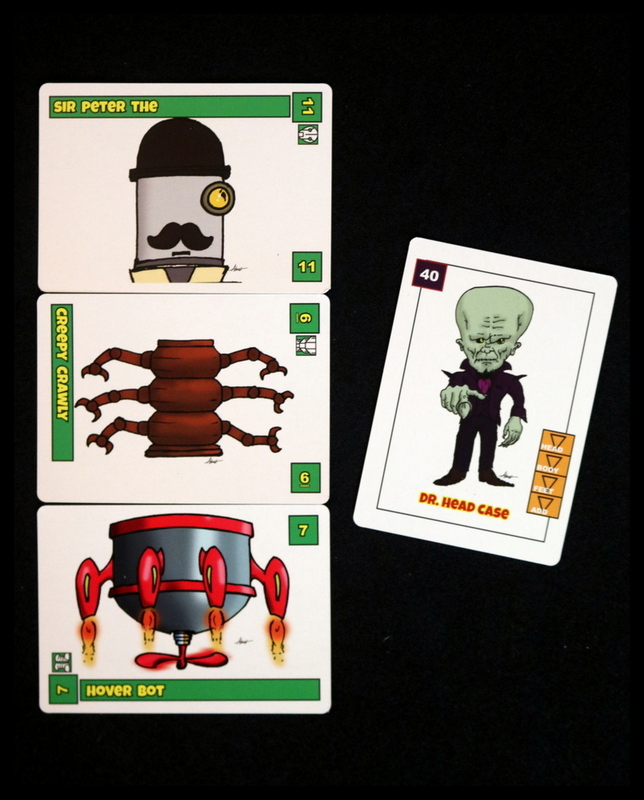 Playable as a full game or just one or two rounds squeezed between other events, comical and futuristic, familiar and new, it fits everything we like in a card game.